After breakfast on day 18 we talked to one of the managers of Te Anau Great Lakes Holiday Park. I asked about the best season to visit Te Anau. Of course the summer, the weather’s better. But If you come in the winter and heading through to Milford it’s fantastic as well cause you see the waterfalls and things like that. Totally different when you see it in the summer and the winter, with the snow on the mountains and that, it’s still pretty as well. Anna and her husband have been managing this place for six years. I asked her what she most enjoyed about the job. Just meeting and greeting different people. Seeing lots of different people and also the lifestyle of it as well. It’s great with the kids, they can come over and hang out and meet lots of new people and aren’t afraid to say g’day and be friendly to any kids running around. But yeah, just the freedom, really. And it’s a great lifestyle. We had lunch by Lake Te Anau. We saw some people kayaking, wakeboarding … and cycling. I’d never seen a bike like this before. Apparently it’s called a ConferenceBike. While we were watching the unusual bike, the Six Surf Lifeguards suddenly drove past. We met them on day 5 when they were setting out from Auckland and we weren’t expecting to see them again until day 20. We followed their vehicle and caught up with them and we had a chat with one of the lifeguards who was about to take a helicopter flight. We’re flying out to Breaksea Sound in a couple of hours. So we’re getting helicoptered out there to a barge. And since there’s no access around this part of the coast, we’ve managed to secure a night on a barge out there. So the guys are coming - about an hour away from it now. So we’re just waiting for the call that they’re there and then we’ll fly in and three of us will change over with three of them and one of them will stay on. And then we’ll stay the night there and continue around to Bluff in the morning. Jason said they were now were six days ahead of schedule because the weather had been so good. I wondered if the trip had been harder or easier than they expected. A bit harder than we expected. Just like, as I said, since the weather’s just been so nice it’s … some days have just been a breeze really. But it really does take it out of your body. Like, each day we’ve got Kate who’s our physio on the trip, so she’s been doing a really good job and sort of keeping everyone in working order. But yeah, nah, it definitely takes it out of you and the guys will come back completely screwed at the end of the day. I asked Jason where he’d seen the most impressive scenery so far. The leg we just did from Okarito down to Haast. It was just, yeah, just like all the glacial rivers and stuff coming out there were just amazing really. It was, yeah, it was just spectacular, eh. One of those, sort of, parts of the country that no one else gets to see. I bought a postcard in a shop next to a big bird. This is a Takahē. 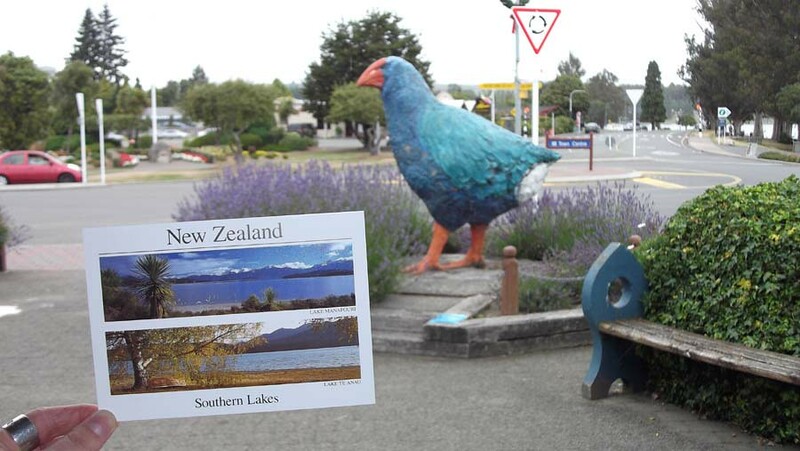 Well, it’s not an actual Takahē … they’re slightly smaller than this statue. 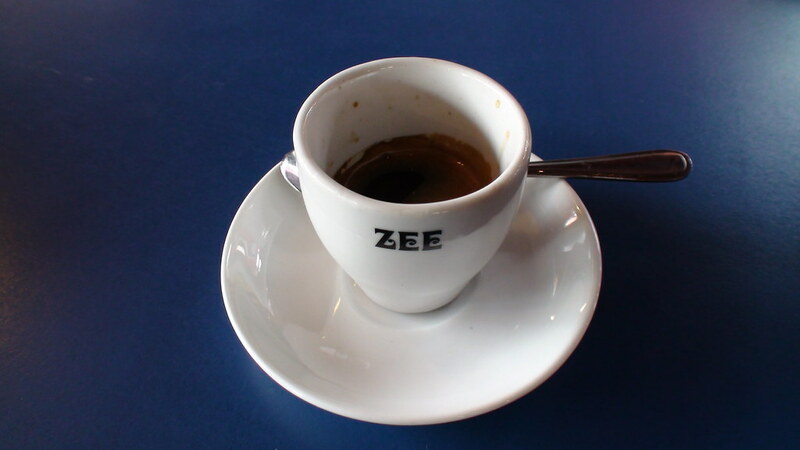 We had coffee at the Olive Tree Cafe … and posted the postcard to the Czech Republic. We stopped at Five Rivers Station to have a look in the art gallery. We saw a sign for a vegetable shop, so we stopped and bought some vegetables. This is the Fairlight Railway Station which was the end of the line for a vintage steam train called the Kingston Flyer. Unfortunately the train stopped operating a few years ago. And this is the bottom of Lake Wakatipu, New Zealand’s longest lake. It’s shaped like a lightning bolt. The tank was almost empty, so we got some diesel in Kingston at a petrol station with no staff. I’d never seen that before. It was pretty cool. I like the last line of their instruction list: Have a great day. We drove through Queenstown to have a bit of a look. Queenstown’s a famous resort town. There are lots of tourists and restaurants and bars. Then we drove to Arrowtown, a former gold mining town. That night we stayed at the Arrowtown Born of Gold Holiday Park. We cooked some of the flying saucer shaped vegetables we bought today. I don’t remember eating these before. They’re a kind of squash.